He's my favourite character of the game. And will be very important on it. Love the artwork and the characters, following! Anyway, thank you!, if you have any advice or doubt about the game, don't hesitate to say it! Sorry! Hahahah, yes tight is a good thing. Make sense? It simply looks like it works VERY well! Oh god, I feel so stupid on this moment, hahaha. A lot of thanks for it!, It tooks me almost 2 remakes to make it like that actually. I like the art direction. If in doubt, do what you did: asking for clarification. I don't want this to die, but I'm really busy with the university things. 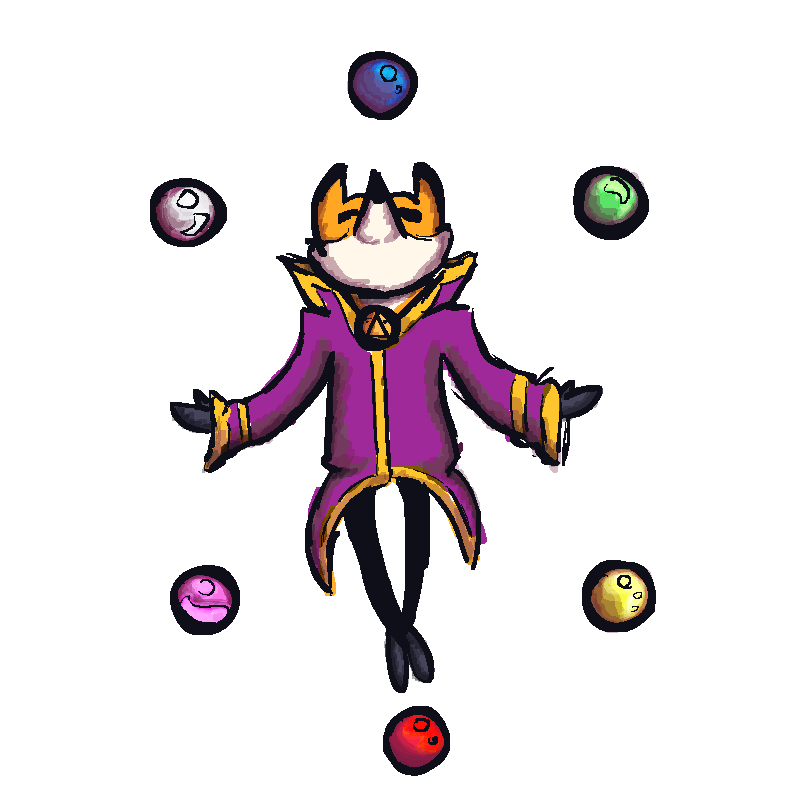 Anyway, this weekend I didn't do anything with the game, just thing about some new things to add listening some Homestuck tracks. So, when I was listening this track in specific I notice the portrait image that it have. And I love it! So, in reference to it, I think in make a game over screen similar to that, but I hasn't time enought to make the screen or a detailed draw of how I will do that, so I draw these 2 images below with MS paint. The first one will be the screen on the first 30 seconds, but after that I wanna start to playing a game over track (something like a medley of the game tracks) and make the player disappears slowly as you can see on the concept of the second image. 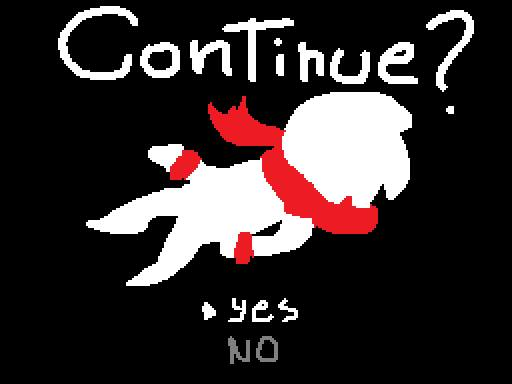 Seconds after the song ends, the player completly dissapears and some particles explodes making the screen goes to white and restarting the game after a "restart" sfx that I'll use a certain cutscene. So... That's all, I'll have no time to work on the game this and the next week. This is my final week, yay! 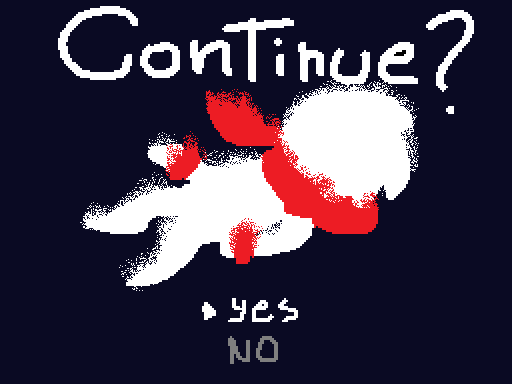 I don't have much to say, I prefer to write everythingwhen I finish the game over screen. Anyway, there's a video of what I was doing this evening. I use some GM functions to work with the pitch and make it sound like a "time stops" sfx. See ya' this weekend with maybe a big update. Actually we have a composer, anyway, he can't do "epic" or orchestal tracks to Final boss battles, so I'm gonna search for a composer for specific tracks on the future. Well, without anything to tell, I'm gonna show you what I was doing this days. 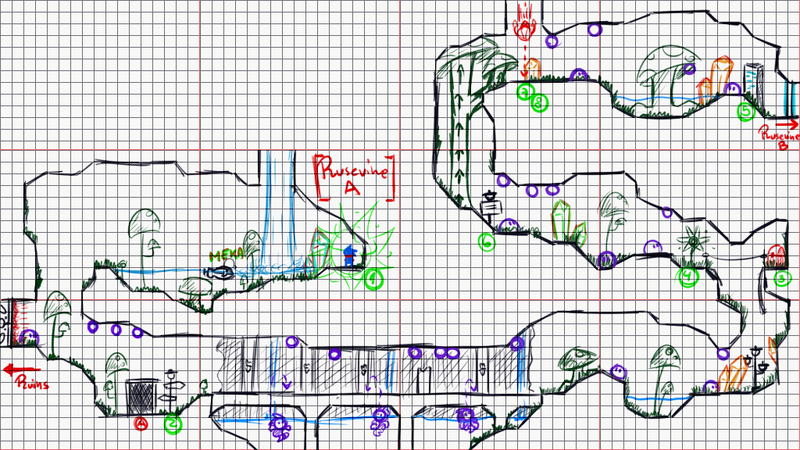 First of all, I worked on an H2O system when the player is on water, similar to Cave Story one. But these two have a big difference, on the Mainasutto's air system, when your air is on 0%, you start to lose HP instead of die. After that, I see that the character development on the game has a lot of changes, specially on the main character, so after searching on everyplace that I remember every remake and version of the game, I did this image showing every main character sprite along the time. Also, I finally added the save system to the game, which looks like the image below at the beggining, but the direction of every soul was too random. Anyway, other thing that I add on the game is the "key to press" sprite on game, as you can see, on the left is the sprite which you will apreciate when the gamepad is disconnected, and otherwise at the right. And finally, I make 2 new icons to the game, but I'm not sure to which could I use to the actual demo. So, if you have any opinion or critics about it, just tell me. Everthing that I tell you on this post, you could watch it in action on the next video. And to conclude, thre is a secret link hidden somewhere on the devlog, so, if want to be a beta tester, be the first on find and comment the video, good luck! Some conceptual diagramation and art 'bout the west wing of Rusevine. And a new image of Houndfox that I called G.O.D. The progress goes better everyday, maybe I'll release a pre-demo on the 4th weekend of December. Actually I'll not be in home for a few weeks, so, I'm programming and doing "conceptual art" with existing sprites on the game. Maybe tomorrow I'll program this and show you some improvements, so before that, any suggestions? I particularly like the side-by-side menu (the bottom screenshot). Gives it a bit more depth, which I like! I'm actually working on it and I like how looks, this is just a WIP gif. I didn't think that it'll take me more than an entire day. I'm really flattered that there are people who comment and follow this devlog. After a long hiatus 'cause I don't have my PC here, and before the last holiday of the year. There is the last update of the 2016!, but, not a big one. PD: It runs at less than 50 fps 'cause I'm testing it on a Celeron 2008 computer. Woah, there's a long time from the last update. I actually decided to make updates weekly only, and post it every saturday by the way. So, here we go, a big update post! 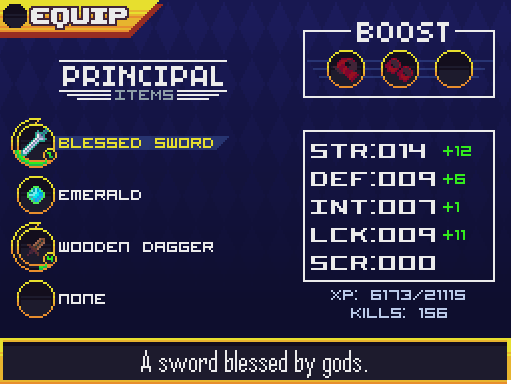 First of all, I started to work on the Equipment Menu, on the Pause system, with some references to Castlevania games, and inspired on some MMORPG that I was playing lasts weeks, plus the weapon leveling system of Cave Story, I make a mockup of this, and looks like this. 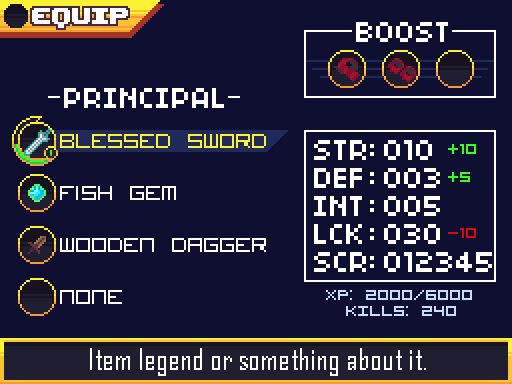 And it'll work on a "3-block setup", and when you press the confirm button, will appear the inventory above the stats, to choose the weapon to use. Also, you can't have 2 times the same weapon, so, every time you get a weapon that you already have, this weapon will be trasformed in experience points to the weapon, that's the one of the ways to level up the weapons, the other one will be with an NPC and the Score system. So, I spend 2 days on the programming of the mockup of this, and it looks like what I show on the video. But I wasn't happy about how it looked, so I amke a few changes on it, first of all, I satured a bit a few colours, next I make the font a bit smaller than the original mockup, and the option to change the background colour to whatever colour you want. So, finally add a "background texture" to the menu, and the result was this. And after programming it, changing a few things of the code, makes it looks like this. After that, I made a mockup of the options menu, and with a few options that I guess, will be the only options if you don't have anything more on mind to add, and looks like this. Maybe I'll add different backgrounds for every orb/option to choose in the main menu of the pause system. Also, some features that I'll love to work to make the game optimizable to every computer is the particles, the frame rate selector and the V-sync. Finally, we actually decided by the team when the 2nd Demo of Mainasutto will be released, so, keep an eye on this months to see what coming next.